We at Theo’s Timber offer laminated worktops in a variety of length and designs. Image by Ice Alien (via Shutterstock). If there’s one thing that makes a statement about your home, it is that of a well designed fitted kitchen. Everything in one place; a coherent workstation; a niche for your nouveau cuisine; a crash pad for your kettle. Key to this is your worktop and we at Theo’s Timber do a good line of laminated worktops. Our laminated worktops come in three different lengths, with a plethora of patterns. These are available in matt, satin, gloss, and glaze finishes. 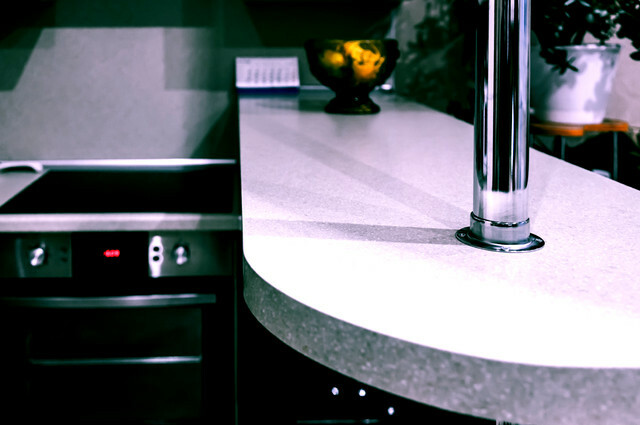 Whether you need enough worktops for a fully fitted kitchen or a worktop for your breakfast bar, we can be of help. Our lowest price worktops come under Group A, followed by Group B (our mid-range lines), and Group C (for our top-of-the-range worktop designs). As well as the sizes we have available to hand, bespoke lengths are available on request. If you have any further queries, why not give us a bell on 0161 834 6789? We would be delighted to hear from you. Theo’s Timber, 19 April 2017.